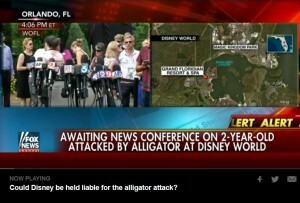 As reported at FOX News, Disney official said Wednesday the company plans to “thoroughly review” its alligator warning signage around a resort where a 2-year-old boy was killed by a reptile that snatched him out of shallow water of a man made lagoon at Disney’s Grand Floridian Resort & Spa. This is all but an admission of guilt by Disney that they were negligent in not having signs up posted that to be aware of alligators. To retroactively try and fix the problem does not deflect them from a potential and probable law suit from the parents of 2 year old Lane Graves. Watch the VIDEO below of the legal discussion with Fox News Sr. Judicial Analyst Judge Andrew Napolitano and Disney’s liability in the death of 2 year old Lane Graves. Napolitano provides a thorough and reasoned legal explanation. Look for Disney to make a settlement out of court so not to make this a public event and ruin the Disney brand. However, make no mistake about it, there will be a law suit on behalf of the child and the parents. This was a horrendous act of unimaginable proportions and I cannot even imagine that a parent could ever rid themselves of the horror of seeing their child attacked by an alligator. How does anyone ever get that image out of their head? A Disney official said Wednesday the company plans to “thoroughly review” its alligator warning signage around a resort where a 2-year-old boy was killed by a reptile that snatched him out of shallow water. The company official spoke to the Associated Press on the condition of anonymity because Disney has yet to prepare a formal statement on the matter. 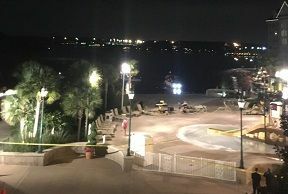 Orange County Sheriff Jerry Demings said his department and the state wildlife agency would look into the issues of warning signs around Seven Seas Lagoon at The Grand Floridian Resort & Spa, where Disney had posted “no swimming” signs but no warnings about the presence of alligators. Dive teams on Wednesday afternoon were able to recover the body of the toddler “completely intact.” Demings said that the body was in water roughly six feet deep, 10-15 yards from the edge of the lagoon where the child had been wading Tuesday night. Walt Disney should be rolling over in his grave … and be ashamed of what his company has become. It would appear that it is not just President Barack Obama who wants to “spike the football” of the heroics of the US Navy Seal Team 6, but now the Walt Disney Company wants to profit from the actions of these heroes and trademark “Seal Team 6″. WTF!!! How does some one get to trademark a name that is part of a US Government military name? Seriously, how is not a government entity part of the public domain? The trademark applications came on May 3rd, two days after the operation that killed Bin Laden… and two days after “Seal Team 6? was included in thousands of news articles and TV programs focusing on the operation. 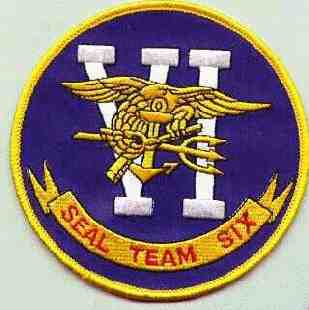 Disney’s trademark applications for “Seal Team 6? cover clothing, footwear, headwear, toys, games and “entertainment and education services,” among other things.